This article will review the role of microvita inside plexuses, the physico-psychic centers of the human body and mind. The word “plexus” is of Latin origin, meaning “interwoven”. Its Latin plural nominative and vocative are plexi, its plural genitive is plexorum, its dative plexis, and its plural accusative plexos. In order to avoid confusion, created by the Latin cases, I will use the word “plexus” for singular and the English “plexuses” for plural. As I wrote before, microvita are tiny little creative catalyzing agents. They build atoms of matter, biology and mind, while cooperating with the characteristics of subatomic particles and pure energy. The smallest containers of information inside theses plexuses, the psychic molecules, are called “vrtiis” in Sanskrit. In his discourses Shri P.R. Sarkar used different nouns to explain their nature: propensity, sensual desire, ectoplasmic occupation, psychic urge, mental propensity and tendency. These six nouns do give an idea about their nature, but are not really crystal clear about their power and intensity. However, he also used “epithymetic influence”. Epithymia is a Greek word, containing the root “thymos”, which is connected with the vital force of life, in the sense of “violence, sudden movement, excessive indulgence and rage.” Epithymia was understood as “the sin of longing for desires outside the will of God”. Now two questions arise. The first is: what can be the origin of this almost violent drive to go against the will of God or, as it can also be understood, against the inner flow of evolution? A second, more practical question is, how can this drive be reversed? In order to discover the principles that influence the power of vrtiis, it will be helpful to investigate the system of plexuses as parts of the human body, as well as at the influence of positive and negative microvita. Medical medicine describes plexuses as areas where nerves bifurcate and rejoin. The four most important of the approximately one hundred known plexuses are the cervical, brachial, lumbar and sacral plexus. The number of medical neuro-plexuses and their location seem to have hardly any direct connection with the metaphysical plexuses. It sounds more reasonable to assume that, if networks of neurons are connected to plexuses, it will be at their subtlest extremities: dendrites and axons. Although the idea of plexuses, or cakras, has its origin in traditional Indian medicine, European mystics were already familiar with them after the Middle Ages. A drawing of the cakras, made by Johann Gichtel, a student of Jacob Böhme, is an indication of this. (See Figure 1.) Gichtel (1638-1710) was born in Regensburg, Germany and lived in Amsterdam around the time of Spinoza (632-177). Shri P.R. Sarkar places these plexuses inside a mandala. (See Figure 3.) Propensities can be expressed internally or externally through the vibrational activity of a cakra. Such vibrational activity causes hormones to be secreted inside the glands and as a result hormones are secreted. In turn these hormones connect with afferent neurons, which carry the created impulses to the central nervous system. The brain weighs this information and decide for one or more internal, external or combined reactions. 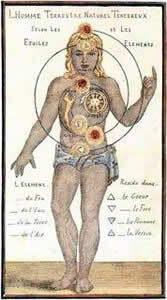 The position of the endocrine glands inside the human body has a direct relation with the cakras. How these glands are activated to release their hormones cannot yet be determined, but research of Dr. Candace Pert in the twentieth century has given a clear indication of their connection with the cakras. All human beings have a bright and a dark side, which can be understood as a metaphor for the polarity of positive and negative microvita. The fundamental polarity of Energy and Consciousness is united with the polarity of positive and negative microvita in chemical compounds, living beings and human beings in particular. “The upper plexus is the abode of positive microvita and is the approach of synthesis. The lower plexus is the abode of negative microvita.” (See Figure 4.) 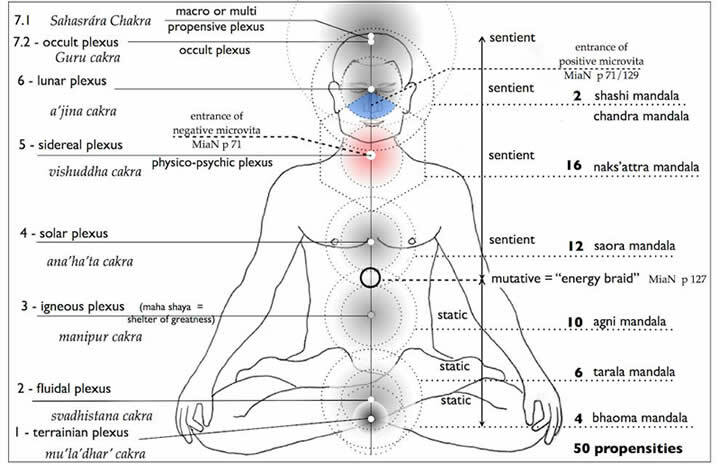 The upper plexus is Guru Cakra, which is the inner part of Sahasrára cakra. “Good propensities are enhanced by positive microvita and the bad propensities are also reduced by positive microvita. Bad propensities may be enhanced with negative microvita and diminished with positive microvita.” So, there is every reason to increase the number of positive microvita, but how to achieve that? Positive microvita can be attracted in five different ways: by the grace of Parama Puru’sa -the Supreme Consciousness- by concentrating the mind on Varábhaya Mudrá, by doing more meditation, by doing kiirtana, -a psycho-spiritual dance- and by satsang -the company of good people. Where do negative and positive microvita enter the body to find their abode and start functioning? 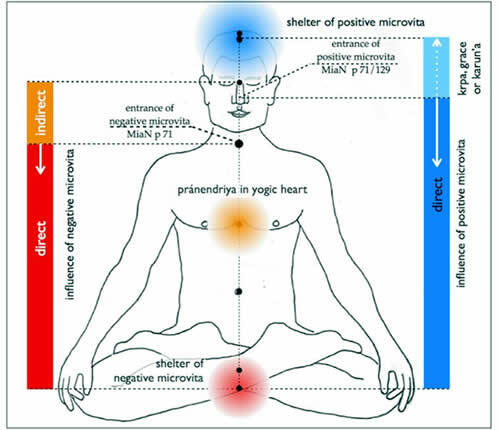 Negative microvita “cannot move above the physico-psychic plexus and can move only downwards” (See Figure 4.) This can only mean they enter the body in the Vishuddha Cakra. The entrance position of positive microvita seems confusing. Shri P.R. Sarkar gave two hints. “Positive microvitum starts its journey in the lunar plexus and moves both ways..”, but also: “From below the left ear to the lower point of the right ear is the sidereal plexus — the Naks’attra Mandala. Generally positive microvita come in contact with the human body through this plexus.” The first hint points at the lunar plexus (sixth cakra) and the second one lets them enter in the sidereal plexus (fifth cakra). But, if the pictures of the two statements are superimposed it can be concluded that positive microvita enter in the area of the nose. All propensities inside the cakras are either guided by negative or positive microvita. The influence of negative microvita is towards physicality and a decrease in expressed consciousness, while positive microvita have a catalyzing influence towards subtlety, towards an increase of expressed consciousness. Let me give one example. Mamata’ -affection- is a propensity found in the Ana’ha’ta Cakra. When Mamata’ is guided by negative microvita it can expressed, both inwardly and outwardly, as attachment to a person, to knowledge or physical posession. If positive microvita are the incentive for action, each person or object will be seen in Universal context. The activation of cakras by microvita knows two extremes. The first is a large deficiency of both positive and negative microvita. 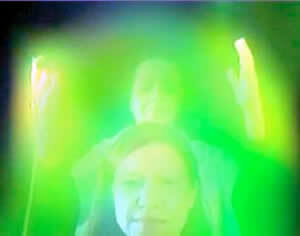 In such a situation all lower chakras suffer too and this forms a big danger for physical, mental and spiritual health. The second is a fully expressed influence of positive and negative microvita. All positive and negative characteristics have developed to maximum levels. What will guide a decision for action in such a person? This extreme seems rare and theoretical. A second intermediate is a relatively high expressed influence of positive microvita and a deficient influence of negative, subtle microvita. Such a cakra shows insufficient contact with the reality of life and, since higher cakras guide the lower ones, also all lower cakras suffer from this imbalance. A third situation is a relatively high expressed influence of positive microvita and a deficient influence of negative, subtle microvita. Positive qualities are mixed with negative qualities. Life means a struggle! All actions in one’s life are guided by the activity of negative and/or positive microvita. Even scientific testing is influenced by it, especially if subtle objects are researched. To conclude one example. I wish you a pure heart. P.R. Sarkar – Prout in a Nutshell; date and place not known.